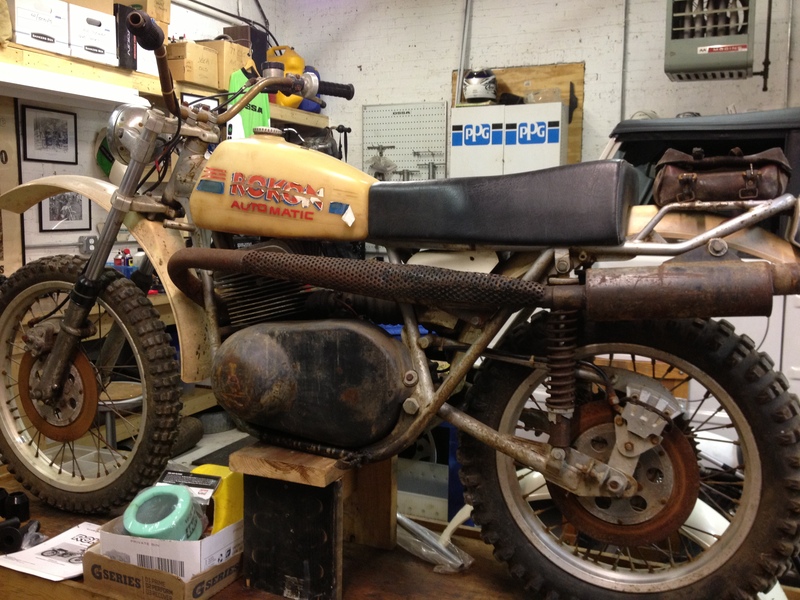 Rokon was known for its two-wheel drive model, the “Trail Breaker” (something like a small tractor – Robbie has one!). The RT-1 was their attempt at a dedicated Enduro bike. Our friend/local guy Larry Flowers campaigned this model across the country at the two-day qualifiers with some success – Drew Kerr was his pit crew! Beaver always had an interest in these bikes, so we decided to get one. Well, that didn’t take long! Lew Mayer said that Mike Murphy (Mr. Rokon) had one for sale. We made the deal and rode down to Mike’s house in Virginia. We came back with the bike and most of the parts needed to complete the restoration. Mike took good care of us. We are proud to add the RT-1 to our collection!